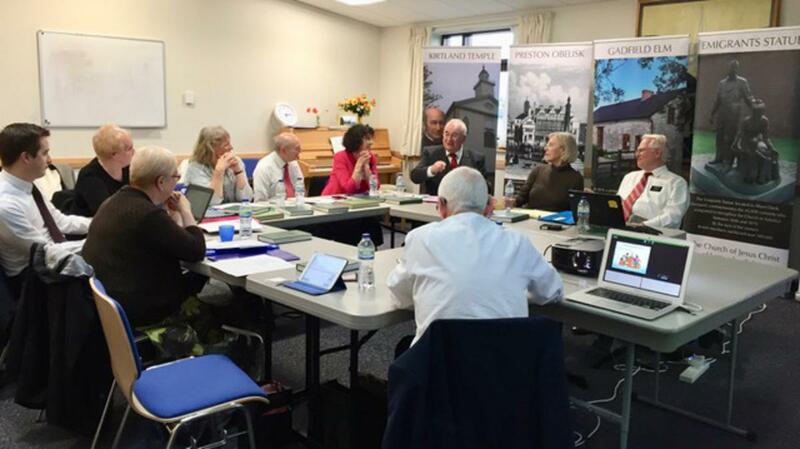 A historic first occurred in October 2017 when the Church History Council for the UK and Ireland met for the first time in the Chorley Stake Centre under the direction of Arnold and June Jones, country Church history advisers. Other members of the council represented England, Scotland, Wales and the island of Ireland, as well as the Records Preservation Centre in Solihull, with the Church history advisers for Europe, Elder and Sister Lear, joining the meeting. With the recent emphasis on the importance of researching and documenting the history of the Church in local areas, a growing number of Church history specialists are being called in stakes and individual units. This has resulted in the identification of sites of historic interest, as well as documents and artefacts, for the Records Preservation Centre; the recording of oral histories with Church members; and assistance being given to stake clerks in preparing stake annual histories. Church history specialists are called to seek out and document those stories and bring them to the attention of local members of the Church, so we can learn from the lives and faith of our predecessors here in the British Isles. In almost any part of this country, we are surrounded by places where members of the Church have met, been baptised, held conferences or been heckled; and of course our very lives are part of the ongoing history of the Church and worthy of being recorded as a means of strengthening and inspiring those around us and future generations. The Church history council was formed so the individual efforts of Church history specialists around the country could be coordinated and larger projects could be undertaken. For example, during the meeting, reports were given on initial plans for a gathering to be held in the autumn of 2018 for those who served as Church building missionaries in the 1960s (see the LDS Church Builders Reunited Facebook page), a proposed LDS Church history exhibit for the Harris Museum in Preston (which could serve as a template for other LDS exhibits in museums around the country), the development of social media for Church history in the UK (such as the British Latter-day Saint History Facebook page), and the development of guidelines for units to write their own histories. Those present at the October meeting were asked to identify their expectations of the council. The range of responses showed what an influence Church history can potentially have, not simply in promoting the growth of Church history in the area and raising the profile and status of Church history specialists as a calling, but also in bringing Church history alive, creating increased opportunities to collaborate with auxiliaries and other Church departments, increasing the capacity to impact people’s lives for good and rekindling the spark of the gospel in less active members.